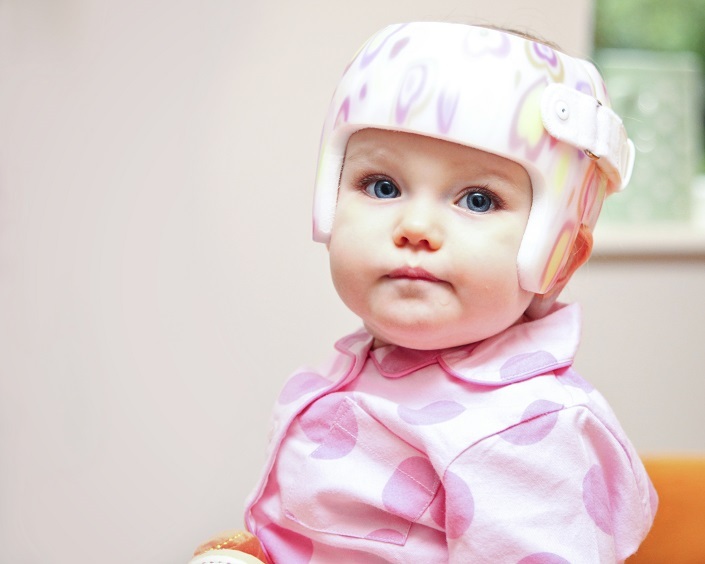 Is there a Link Between Plagiocephaly and Development Delay? Forums like BabyCenter reveal that many parents are concerned about a potential link between plagiocephaly and development delay. It seems that a number of children who have experienced plagiocephaly can also have other neurodevelopmental issues but with little research conducted in this area, a cause-and-effect relationship between plagiocephaly and neural development can be difficult for parents and healthcare professionals to establish. A 2010 study on the neurodevelopment of children with plagiocephaly sheds light on the possible relationship between plagiocephaly and development delay. Matthew L. Speltz and his team compared the neurodevelopment of six-month-old infants with and without deformational plagiocephaly. The incidence of developmental delays in affected children was significant, especially in terms of motor function. However, they also point out that motor, language and cognitive skills are closely interlinked in young infants, making it difficult to differentiate between the three with complete certainty. At best they found that there was a variance in motor skill development amongst infants with plagiocephaly. So, there is an established link between neural development and head shape deformities, although more work needs to be done in order to define which the initiator of either condition is. In 2010, Speltz and his team recommend that paediatricians pay close attention to the developmental rate of children with plagiocephaly. While research on the relationship between plagiocephaly and developmental delay is still limited at present and more rigorous investigation is needed to establish the cause of developmental delays in children who have deformational plagiocephaly, there are an increasing number of studies and research being conducted around the possible link. A study which was undertaken by Robert Miller reported that 25 of the 63 children (39.7%) with persistent deformational plagiocephaly had received additional help during school including special education assistance, occupational therapy and speech therapy and just 7 of the 91 siblings (7.7%), serving as controls, required similar services (2). There are limitations which arise in this study, largely due to the very small focus group which is outlined by Miller himself who concludes, “there is a need for additional research on the long-term developmental problems in infants with deformational plagiocephaly” to establish a more definitive link between deformational plagiocephaly and developmental delay. Susan Orra reports a similar conclusion to the study in her recent evaluation of The Danger of Posterior Plagiocephaly and advises that “regardless of the cause, it is important to screen for posterior plagiocephaly early in infancy so that appropriate treatment can be implemented” (3). The official journal of the American Nurses Association (ACA) also stresses the importance of receiving treatment for plagiocephaly in early infancy. Plagiocephaly treatment lessens the risks that are becoming emergent through cumulative research into the cause and effect relationship between deformational plagiocephaly and developmental delay. Laura Steinmann states, “It is a mistake to classify plagiocephaly as a low priority or minor cosmetic issue and not provide early treatment, because the opportunity to intervene occurs while an infant’s skull bones are still mouldable” (4). Furthermore, recognising plagiocephaly in the earliest stages of baby’s life is important to rule out more serious causative factors such as craniosynotosis. The ideal age to start a treatment is 4 to 7 months, but we can start plagiocephaly treatment up to the age of 14 months. An earlier start in treatment gives fuller and quicker results because there is more opportunity for growth to bring about correction in head shape. For more information on how old is too old for flat head syndrome treatment, read our informative blog post which goes into further detail about the optimum age for treatment and what results you can expect. Browse our website for more information on plagiocephaly and related conditions, including symptoms, diagnosis and treatment. Alternatively, call us on 0330 100 1800 or 0113 218 for expert help and advice, or to arrange an appointment with a plagiocephaly specialist. (2) Miller, Robert I., and Sterling K. Clarren. “Long-term developmental outcomes in patients with deformational plagiocephaly.” Pediatrics 105.2 (2000): e26-e26. (3) Orra, Susan, et al. “The Danger of Posterior Plagiocephaly.” Eplasty 15 (2015). (4) Steinmann, Laura C. “Strictly Clinical.” (2016).